Moving on with Lillet — The Old Town Alchemy Co.
Lillet was founded in 1872 by two brothers who had made themselves a career as wine merchants. Right now, it's probably more famous for what it was rather than what it is - and you can blame James Bond for that. Three measures of Gordon's, one of vodka, half a measure of Kina Lillet. This recipe, given to the bartender at the Royale-Les-Eaux casino by 007 in his début, represents something of a dilemma for the cocktail bartender. I've lost count of the number of people who've asked for a "vodka Martini, shaken - not stirred" in the months after the release of a Bond film without really knowing what they were getting themselves into. We, members of the secret brother/sisterhood of bar geeks, would roll our eyes, knowing that Bond didn't drink vodka Martinis. He drank Vespers - and he'd do it alone, because Kina Lillet wasn't available anymore. The "Kina" refers to quinine, which was the only ingredient other than citrus liqueurs and Bordeaux that I can remember Sébastian referring to through the tasting. 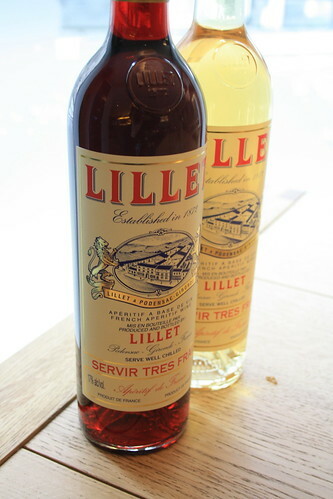 When the recipe was reformulated in 1987, the level of quinine was reduced - not completely removed; there's still a pleasant bitterness across the range - and the product was relaunched as Lillet Blanc. It's said to be less bitter and less sweet than Kina Lillet, but I haven't got a frame of reference - I've never tried Kina Lillet and the opportunity to do so seems pretty unlikely if they stopped making it almost a quarter of a century ago. We tasted three expressions of the aperitif - the Blanc, the Rouge and the 2006 Vintage Jean de Lillet Blanc. They're all made in a similar way, adding a fruit liqueur flavoured with a range of citrus peels, quinine and other, secret aromatics to Bordeaux wine. All three offer a deep citrus flavour with more sweetness than I'd expected and a touch of bitterness, but each also has distinct characteristics that I'd guess are attributable to the wines used. The Blanc is refreshing and light; the Rouge is richer and slightly tannic. The Jean de Lillet is only made when the company's maître de chai comes across a wine good enough to be commemorated. The 2006 vintage we tasted seemed more rounded and slightly more bitter than the Blanc. For anyone who's wondering why it's not in the photo, it proved to be the most popular bottle in the room. France is Lillet's main market and over there they drink it straight-up, chilled but it's often hard for me not to try something out in a mixed drink. Gin, particularly something juniper- and citrus-heavy like No. 3, seemed like a natural choice, and the recipe wrote itself from there. Shake all ingredients with ice and fine-strain into a chilled cocktail glass. 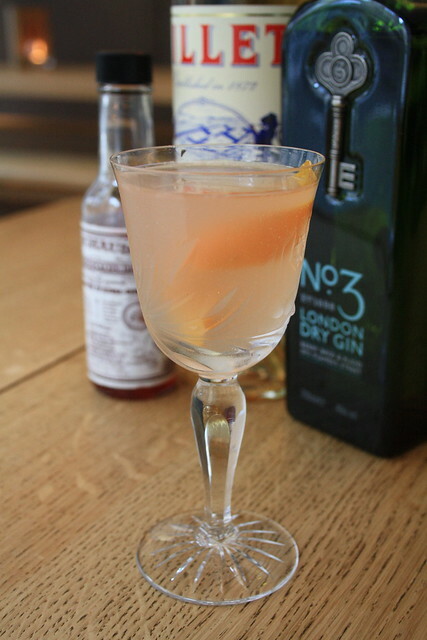 Posted on March 23, 2011 by Jon and filed under Mixology, Recipes and tagged aperitifs cocktails fortified wine gin Lillet No- 3 Gin Peychaud's Bitters.